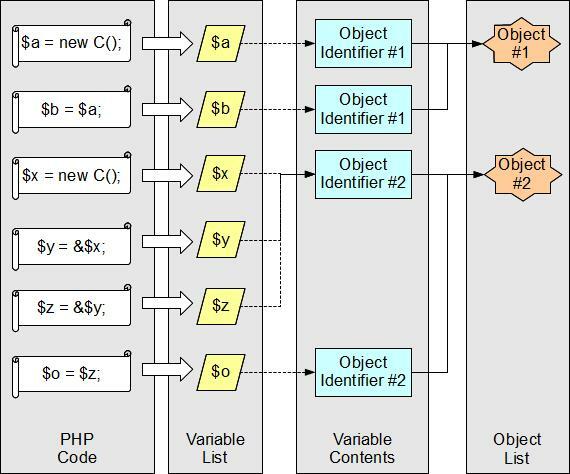 This section describes what is in an object variable - An object variable actually contains the object identifier that points to where the object is stored. What Is in an Object Variable? An object variable actually contains the object identifier that points to where the object is stored. When assigning a variable $a to a new variable $b, using ($b = $a), the content of $a is copied to $b as $b's content. If $a's content is an identifier to an object, $b's content is copy of the same identifier to the same object. A variable reference, &$x, returns an alias to the original variable. When assigning a variable reference &x to a new variable $y using ($y = &$x), the new variable become an alias in the alias group of original variable. All aliases are sharing the same content. "Soft Sharing" - Two variables can share an object with the same identifier stored in their own contents, like $a and $b sharing Object #1. "Hard Sharing" - Two variables can share an object with the identifier stored in their shared content, like $x and $y sharing Object #2.